Welcome to the fifth day of 31 Days of Simple Organization! To read all the posts in order, visit the Overview Page. Today we’re going to focus on organizing a little area so you can create a place of rest for yourself. I did this in my bedroom. To create a place of rest in your own home, think creatively. 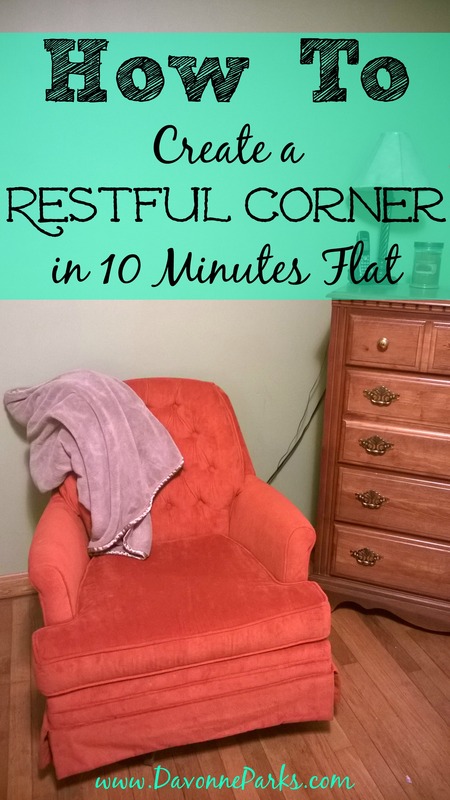 Do you have any nooks or corners that aren’t being used? A stair landing, perhaps, or maybe an empty porch that is just begging for a little chair? If you have a very small home, you could put a candle and lamp next to an existing chair to make it feel more welcoming and restful. Or maybe you could tidy your bathroom then place a lamp, a candle, and a book in there so things will be ready when you’re able to take a long, relaxing bath. When you’re doing this, don’t worry about making a bad decorating choice – something The Nester taught me is that if you don’t like your new decorating arrangement, you can just put it back where it was before and nobody has to know! Today’s Simple Organization challenge: Take 10 minutes to organize a small area and create a little restful corner for yourself.